Two years ago the Savage reinvention of the slug gun, the 220F, appeared. Introduced in late 2009, it was considered a 2010 model. The 220 slug gun has been an instant hit, so now for 2012 it is offered in a stainless steel version. The basic specifications have not changed much nor would they be expected to. Features: AccuTrigger, Stainless barreled action, free-floating and button-rifled barrel, detachable box magazine, controlled round feed bolt with oversized bolt handle, and swivel studs. On top of a Picatinny rail I mounted what I consider an ideal scope for a slug gun: the Minox ZA 5 1.5-8 x 32mm that is covered in more detail here: http://randywakeman.com/Minox_ZA5_1-8x32Riflescope.htm . When it comes to scope mounting, a rail mount (offered by EGW and Warne) allows you to mount most any sighting system you like, without being concerned about scope main tube length. The 220F is essentially a long action, so like all Savage AccuTrigger rifles when using two piece bases you use the round receiver, front and rear type as both bases are identical. A full-sized scope is easier to mount than the short, stubby scopes that are increasingly common, so it is something to take into consideration before you buy a scope. On the hang tag attached to the trigger guard, above, Savage recommends three shells: the Remington AccuTip in 2-3/4 inch and 3 inch, and the Federal Barnes Expander 3 inch loads as well. Problem is, Federal discontinued the Barnes loadings, apparently because Barnes was acquired by their competitor, Cerberus-Remington. Federal has now introduced their own twenty gauge saboted slug rounds, the Federal Trophy Copper loads that throw a 275 grain projectile, both in 2-3/4 inch and 3 inch. This Savage came with a factory test target, showing a three-shot 100 yard 1 inch group with 3 inch Remington AccuTips. After mounting the Minox, it was quickly off to the field to do a little comparison after initial targeting at 30 yards. 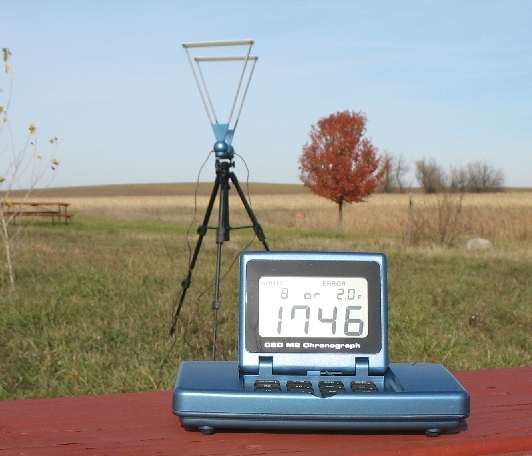 A warm, gusty day, the range conditions (5 - 19 mph wind) were a very long ways from ideal, so we set up at a laser-verified 85 yards. The embedded video should give you an idea of some of the results. Preliminary results favored the Federal Trophy Copper 3 inch, the Federal Copper 2-3/4 in., and the Remington AccuTip 3 inch in that order. Your individual rifle may well shoot a bit differently, so you'll have to perform your own trigger time like everything else. For those interested in Ballistic Coefficients of these loads, there isn't tremendous difference: the AccuTip has a static BC of about .146, the Federal with a static BC of .160. Theory has it that three inch shells tend to group a bit tighter as there is less freebore when used in a 3 inch chambered gun. I've found it to be true only sometimes. Even though "3 inch" shells are called just that, the three inch refers to approximate unfolded length. 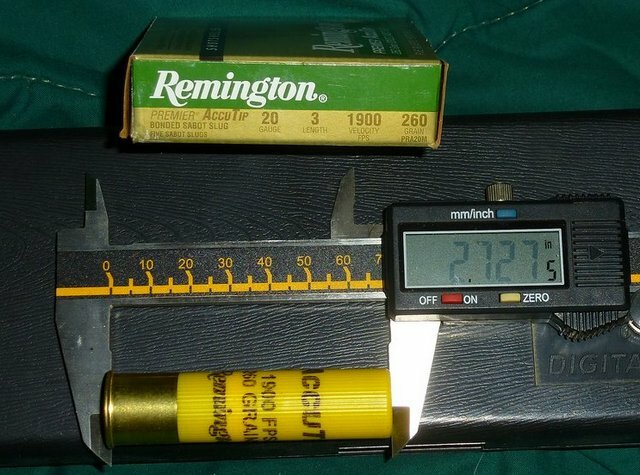 As you can see in the above photograph, the 3 inch Remington AccuTip measures less than 2-3/4 inches in unfired condition. Even with a so-called "three inch shell," freebore to get to the forcing cone is still present, just not as much. Oddly, the stamp on Savage 220 barrels says "20 gauge 3 inch shells." This is incorrect, it should say "3 inch chamber for 2-3/4 in. and 3 inch shells." You can use either 2-3/4 in. 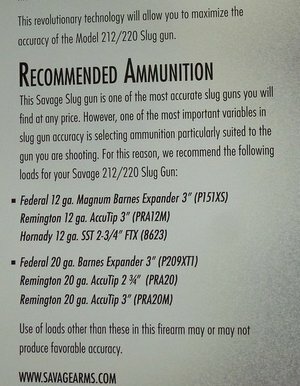 or 3 inch saboted slug shells; Savage recommends both on the hang tag, if not in the owner's manual. There is no hard and fast rule about what one gun will prefer. For example, with a blued Savage 220, the 2-3/4 in. AccuTips were actually more consistent than their 3 inch counterparts. The velocities printed on ammo boxes don't mean much. Most "1900 fps" slug loads average 150 fps or so slower. The reason is that ammo companies use a "standard 30 inch test barrel" for 20 gauge slug guns, even though they are not offered or wanted in hunting rifles. You'll have to confirm trajectories with your rifle, under your ambient conditions, at the ranges you are going to hunt at. A rough idea is sighted in 3 inches high at 75 yards with the 3 inch Federal Trophy Copper, assuming a six inch kill zone, you have about a 160 yard center of the body hold deer rifle. 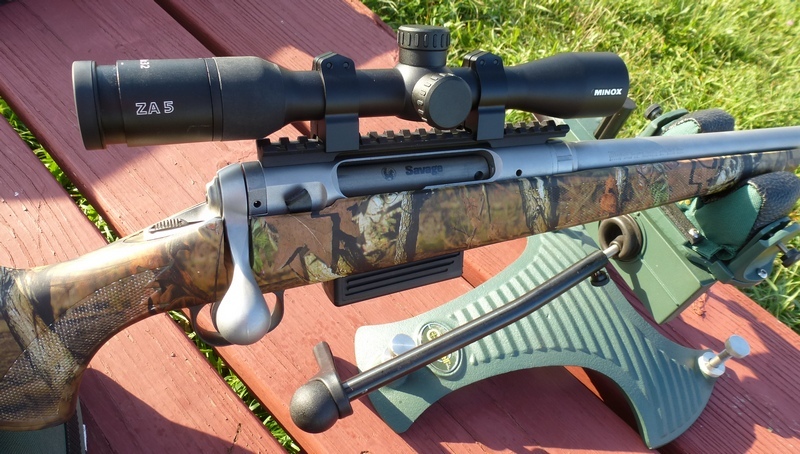 There isn't much not to like about the Savage 220. Personally, the only thing I find that detracts is the ridiculously large, super-sized bolt handle that is unsightly and unnecessary. Overall, the Savage 220 is a fine-handling, comfortable to shoot, easy to use, superbly accurate slug gun with a superb trigger. Shotgun deer and black bear hunters have never had it so good.